New Delhi: An old video of Indian policemen beating a crowd went viral in Pakistan Sunday. In the video, the khaki-uniformed cops can be seen wielding lathis and striking at members of the crowd trying to escape. 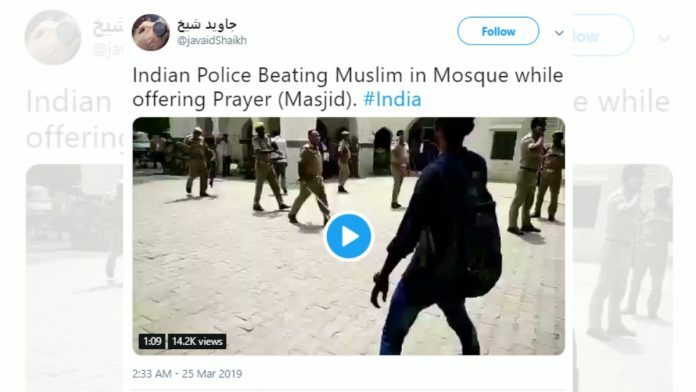 Shared by the handle @javaidShaikh on Twitter, the tweet carrying the video claimed the crowd was being beaten while offering prayers at a mosque. “Indian Police Beating Muslim in Mosque while offering Prayer (Masjid). #India” said the tweet. It was retweeted on the microblogging site over 600 times, liked over 400 times, and viewed over 13,000 times. Pakistani journalist Sabena Siddiqqi replied to @javaidSheikh’s tweet saying “terrible”, and then retweeted it to her 34,900 followers. However, the original footage is from 12 June 2018, and the crowd the police was dealing with was neither Muslim nor the place a mosque. The local police had lathicharged a group of Hindu Jagran Manch activists in Aligarh for demanding the arrest of a man who had attempted to a kill member of their group. The group had alleged the police wasn’t doing a good enough job, and, in protest, locked the gate of the senior superintendent of police’s office. The police had then resorted to lathicharge as a means to disperse the crowd.